Join ProwlerNYC to see the local haunts of the mad genius who brought us the Induction Motor, Current Wars, power distribution, a deluge of patents, and a fantastic deserted monument designed by the eminent architect Stanford White, meant to generate wireless power, graphic images, sounds, data and maybe even a focused DeathRay into the aether! 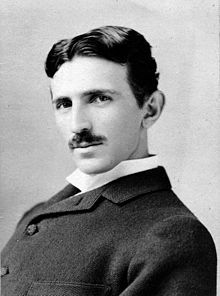 Backed and then deserted by the Robber Barons of the last century, Tesla’s musings, inventions and rantings predicted and gave form to our modern technological era. Join me to walk in the footsteps of this eccentric and colorful resident who left a charged impression on Our Fair City. Tour meets at SE side of Tesla Corner, 6th Ave./W. 40th St.; ends at the New Yorker Hotel, W. 34th St./8th Ave.
Tickets MUST be purchased in advance and will not be sold day of the tour ($30).